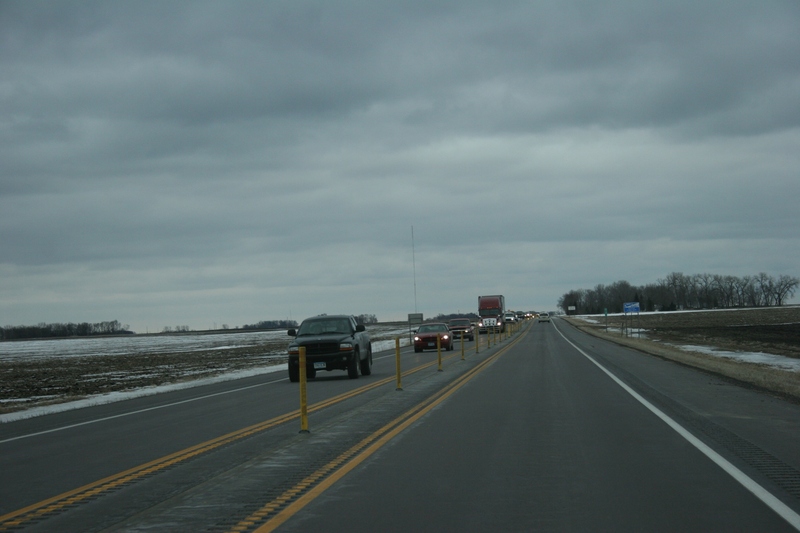 IF YOU EVER HAVE traveled U.S. Highway 14 west of North Mankato, you will understand why I am thrilled that something is finally being done to improve a small stretch—the 10 miles between North Mankato and Nicollet—of this deadly roadway. Heavy traffic on U.S. Highway 14 between Nicollet and North Mankato late last Sunday afternoon. Based on my more than 30 years of traveling Highway 14, I can unequivocally tell you that this rural roadway rates as dangerous. Think narrow lanes, heavy traffic, speeding, few opportunities to pass safely and too many drivers passing when they shouldn’t be. Did you catch that statistic? A fatal and serious injury crash rate 50 percent greater than comparable rural state highways. Impressive and scary, huh? 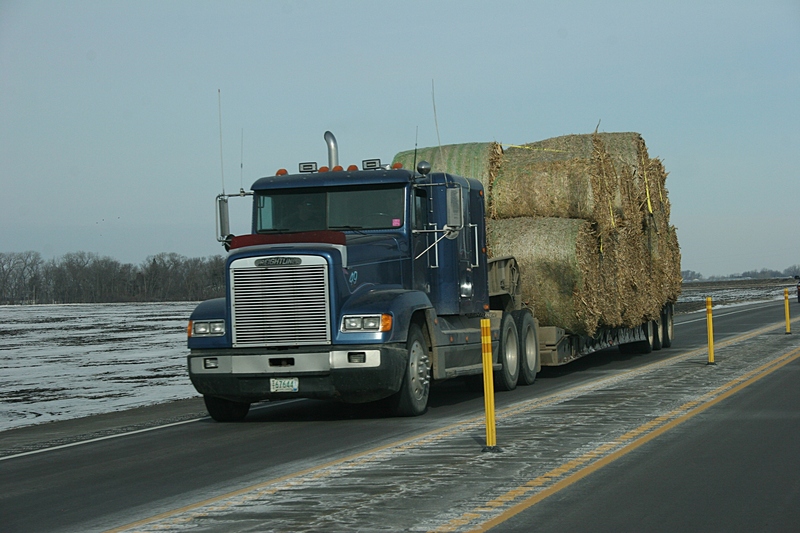 You’ll see lots of semis traveling this stretch of rural Minnesota highway. This recently-installed buffer strip now runs all the way between North Mankato and Nicollet. 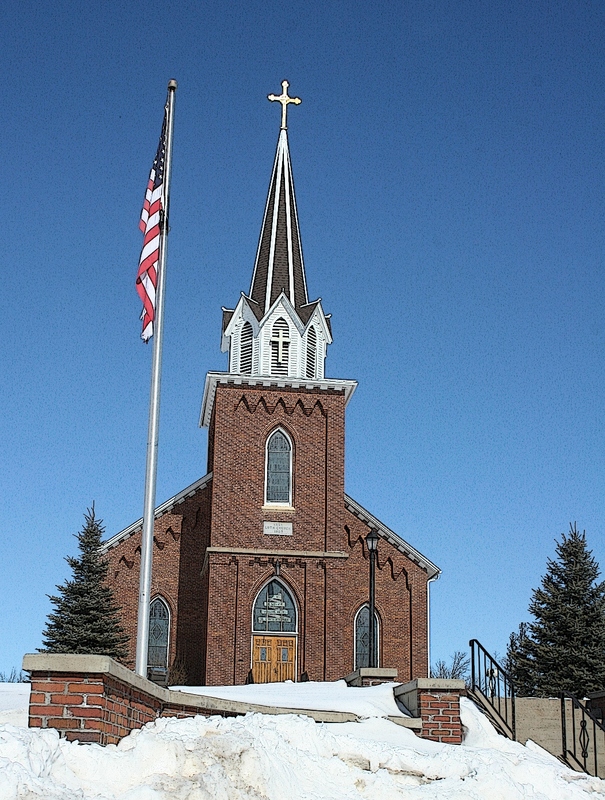 In recent years, when traveling to southwestern Minnesota to visit family, my husband and I often have taken the “back way” to Nicollet from Faribault, passing through towns like Le Center, Cleveland and St. Peter, to avoid that horrible 10-mile stretch of Highway 14 from North Mankato. We’ve checked mileage and travel time and found both routes to be nearly identical. 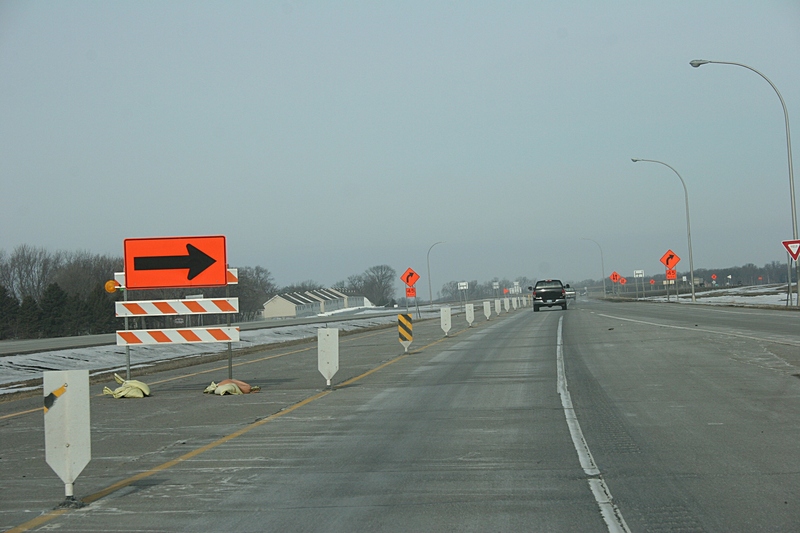 Entering the construction zone, westbound on Highway 14 in North Mankato. But many times we still take Highway 14 between North Mankato and Nicollet. Now it’s a bit safer with a buffer, traffic sticks (to prevent passing) and rumble strips recently added between lanes. Those changes marked the first stage of efforts to make this area of roadway safer. 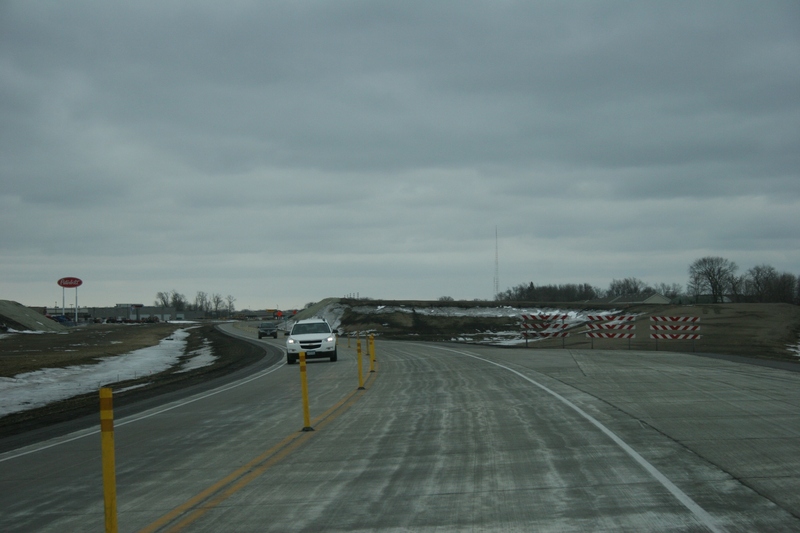 We were driving eastbound in this Highway 14 construction area in North Mankato when I snapped this photo. Sometime in 2017 or 2018, construction is expected to begin on a project which will extend the four-lane all the way from North Mankato to Nicollet. Finally. That still leaves about 15 miles of dangerous Highway 14 travel between Nicollet and New Ulm. Ten miles are a start in saving lives along this notorious rural roadway. But I, personally, will not be satisfied until the entire 25-mile stretch between North Mankato and New Ulm becomes a four-lane. 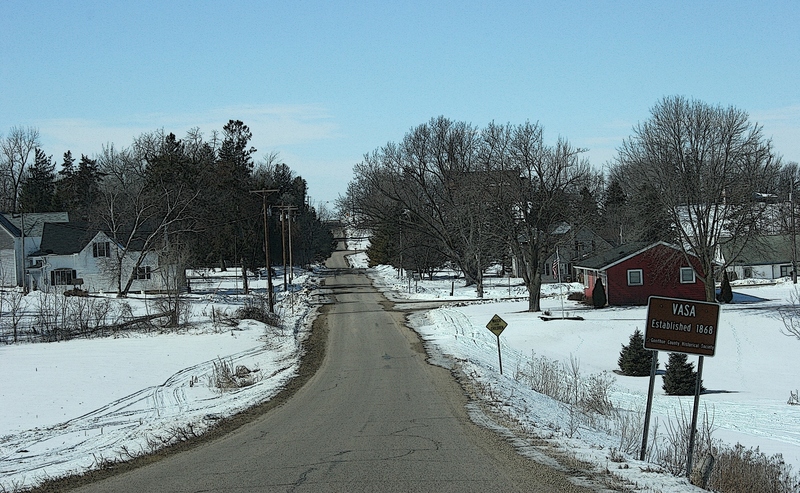 Highway 14 slices through agricultural land, as seen in this photo taken between Nicollet and Courtland. IF YOU’VE EVER driven Highway 14 between North Mankato and New Ulm, I’d like to hear your stories and thoughts about travel there. To see the entire listing of 2013 MnDOT road construction projects slated for Greater Minnesota, click here. 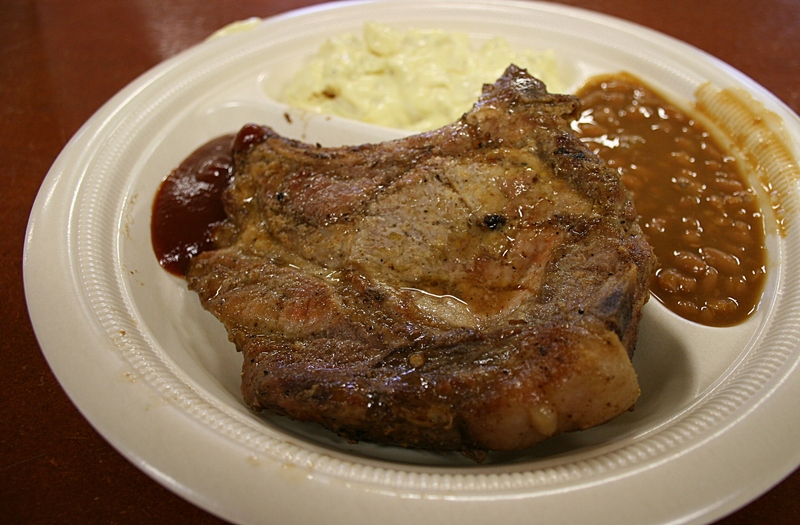 Pork chop supper take-out at the Vesta Community Hall. 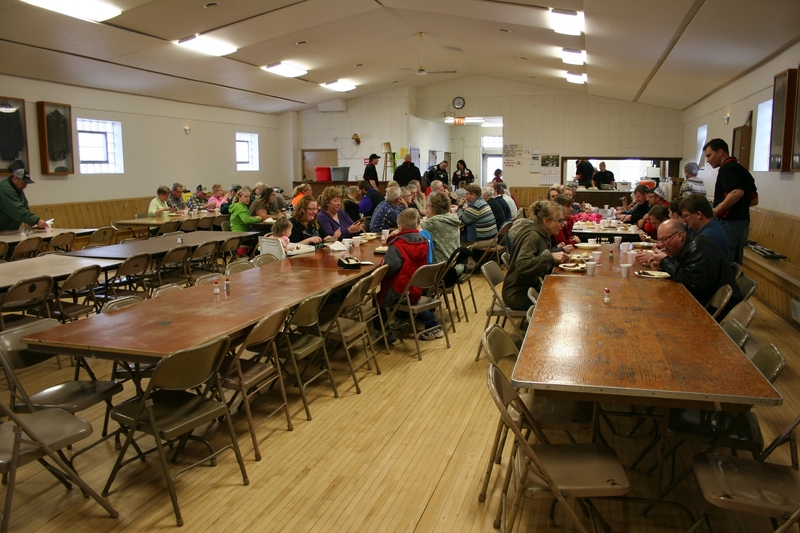 SMALL TOWN, MINNESOTA, on a Saturday night, and I am snapping pictures at a pork chop supper in the community hall. 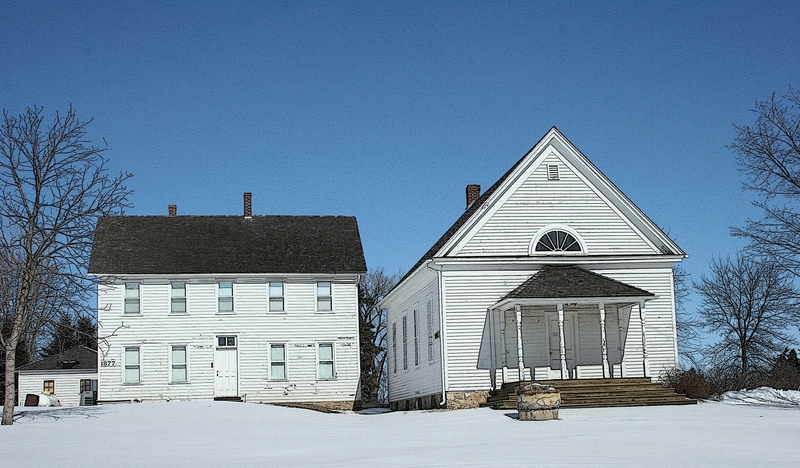 This could be Any Town, rural Minnesota. 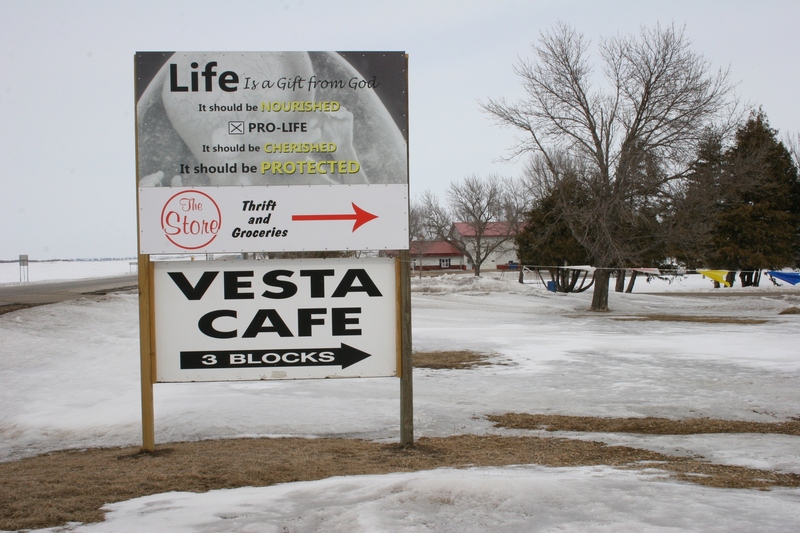 But this is my hometown of Vesta, population around 330, situated half way between Redwood Falls and Marshall along State Highway 19 on the southwestern Minnesota prairie. 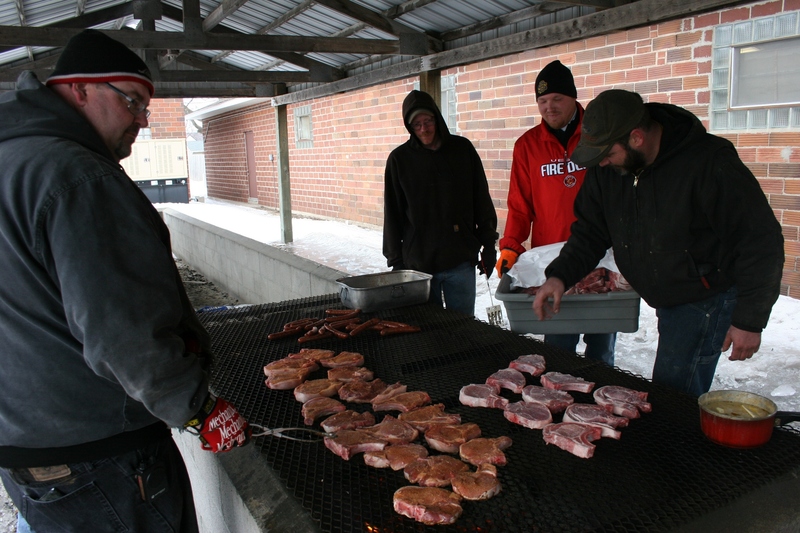 Volunteer firefighters, including my cousin Randy, left, grill pork chops outside the hall. 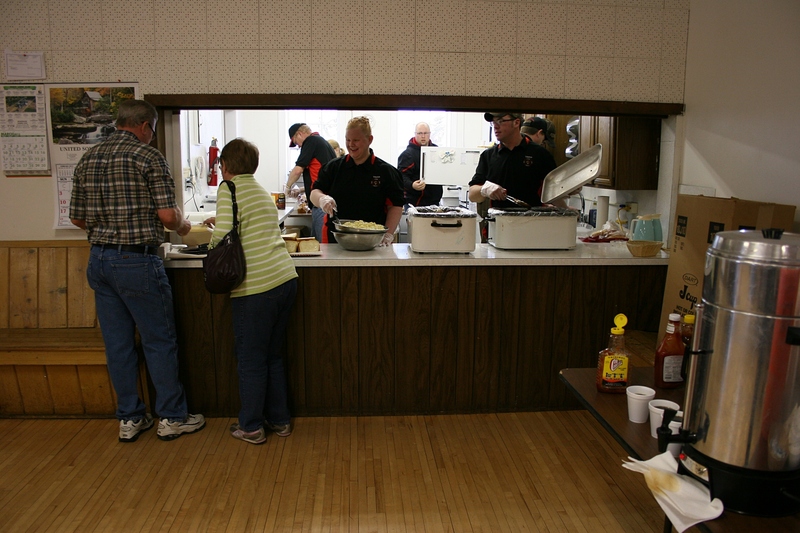 The firemen served about 250 meals. Outside the hall, several volunteer firemen, including my cousin Randy, are grilling chops over an open charcoal pit for the annual Vesta Firemen’s Relief Association Pork Chop Supper. Harlan and Karen step up to the serving window, where Erin, center, and other volunteers dish up food. The grilled pork chop meal. Inside, Randy’s wife, Erin, and others are scooping up baked beans and potato salad and parceling out chops while other volunteers sell tickets and pour beverages. My nearly 81-year-old mom, whom we are visiting for the weekend, is treating my husband and me to supper. I knew most of the diners. 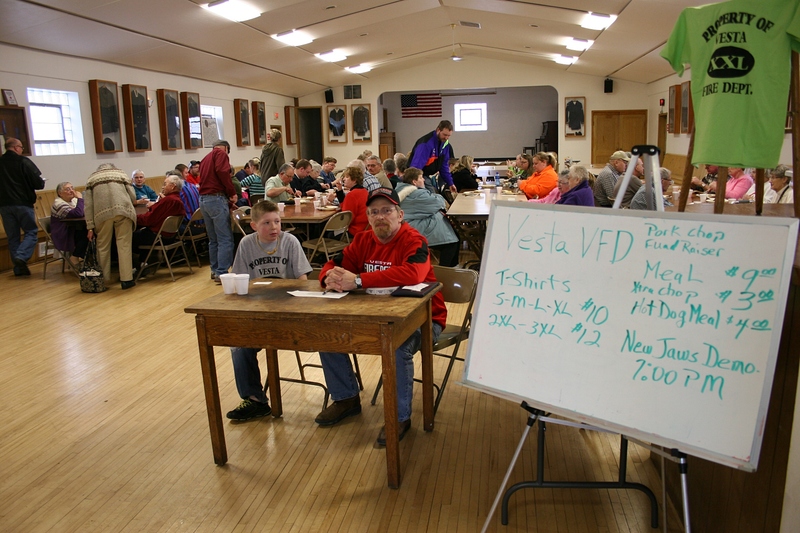 As I mingle among diners, chatting with aunts, an uncle, cousins, and locals I haven’t seen in awhile, I’m cognizant of the importance of this event to raise funds for the Vesta Volunteer Fire Department. Proceeds will go toward a new $25,000 Jaws of Life device, already purchased with a $5,000 grant, past Pork Chop feed dollars and a loan. Volunteer firemen remove the windshield from a junk car. After finishing my meal, at 7 p.m,, I step outside the Vesta Community Hall to observe several volunteer firemen remove a windshield and peel open the doors of a junk car using that new Jaws of Life. 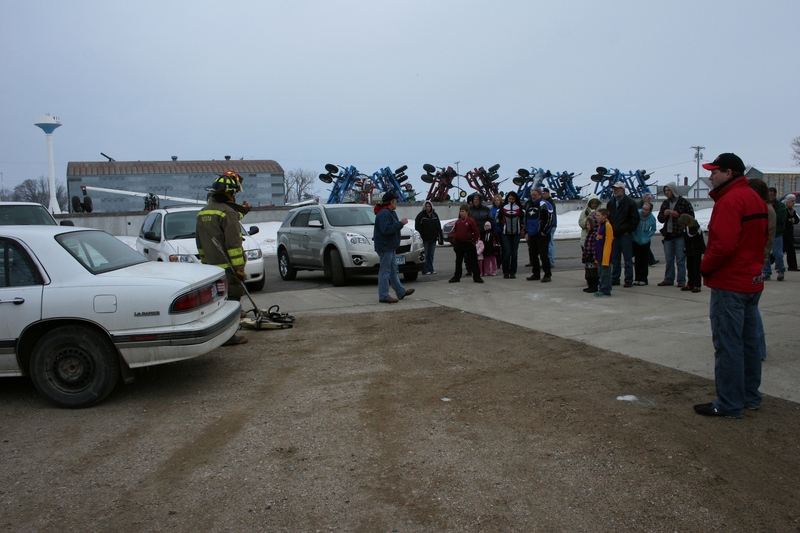 About 30 onlookers gathered outside the hall to watch the Jaws of Life demonstration. Bracing myself against the stiff wind in a “feels more like 15 than 30 degrees,” I question my judgment in roving around the “accident scene” taking photos. Why would this crowd of about 30 stand outside in this raw weather watching this demonstration? Because they care. Because they support their local volunteer firemen and First Responders. Because they know this could be them or their next-door-neighbor or their sibling or some stranger off the highway in need of rescue and emergency care. Peeling away doors with the new Jaws of Life. 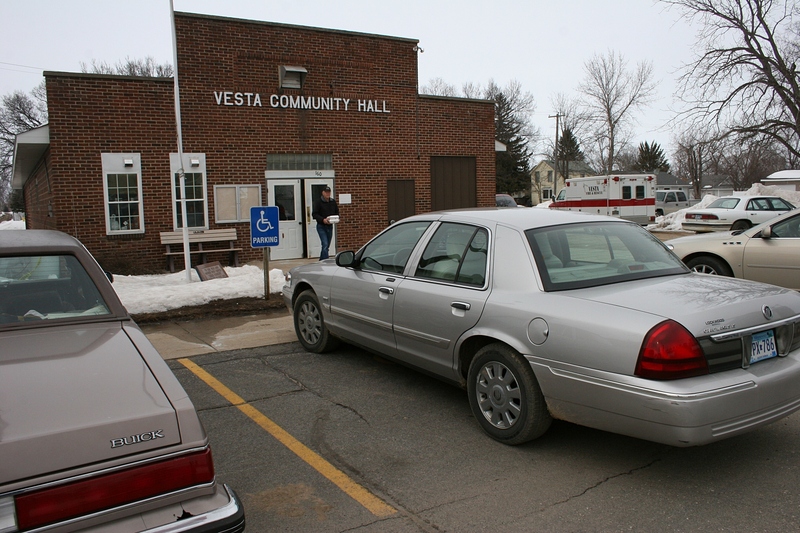 The fire department typically responds to 12 – 15 fire calls annually in a 61 square mile area covering the City of Vesta, Vesta Township and part of Underwood Township, according to Fire Chief Travis Welch. In 2012, firefighters fought a major shop fire. They also responded to two head-on crashes which left three dead. 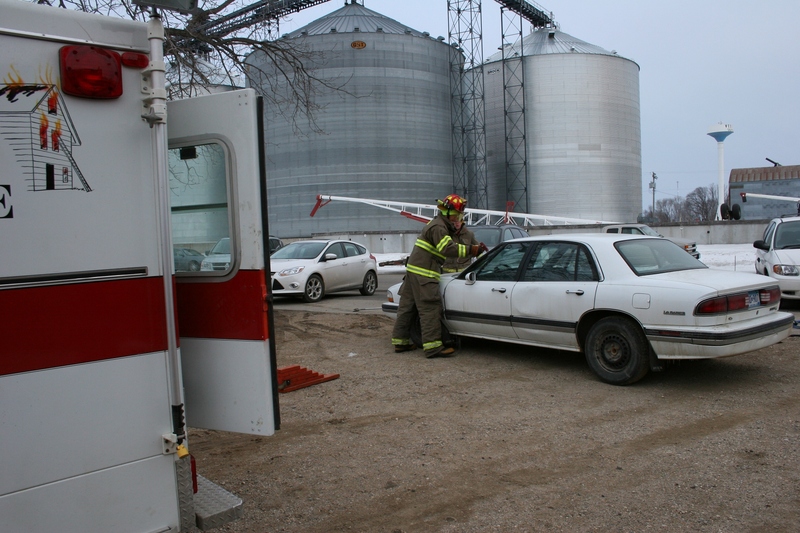 Eight of the volunteer firemen serve as Vesta First Responders. To the 18 volunteer firefighters—Travis, Jeremy D., Dallas, George, Randy, Tony, Aaron, Jeff, Jeremy K., Jon, David, Brian, Jason, Andrew, Neal, Jordan, Ryan B. and Ryan E.—thank you for being there for my hometown of Vesta. 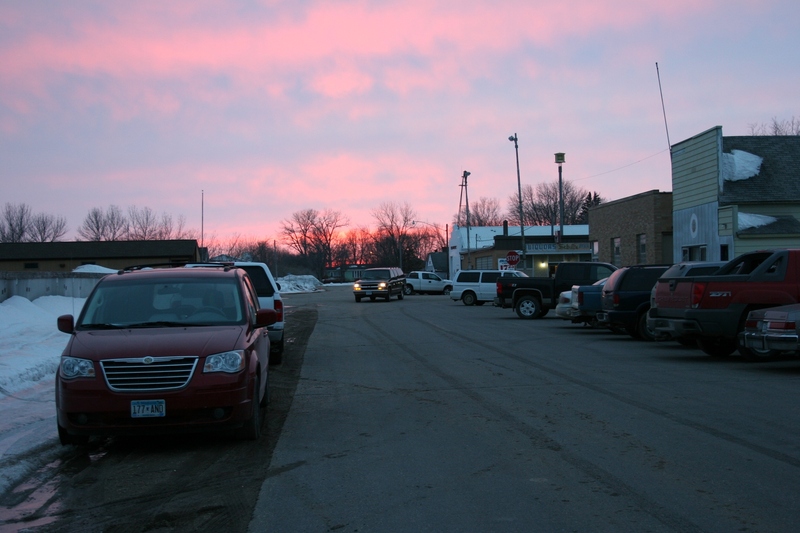 Standing in front of the community hall, I turn and watch the sun set in my hometown. 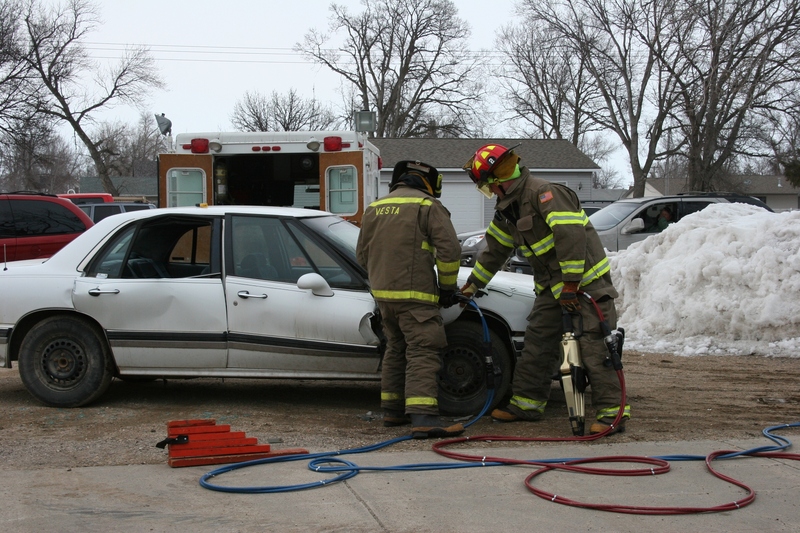 The new Jaws of Life replaces jaws more than 20 years old and “unable to cut some of the new high tensile steel in today’s cars,” according to a letter from the Vesta Firemen’s Relief Association. I LOVE BERNADETTE THOOFT’S infectious laugh and outgoing personality. And I love what this mother of seven is doing for my hometown. 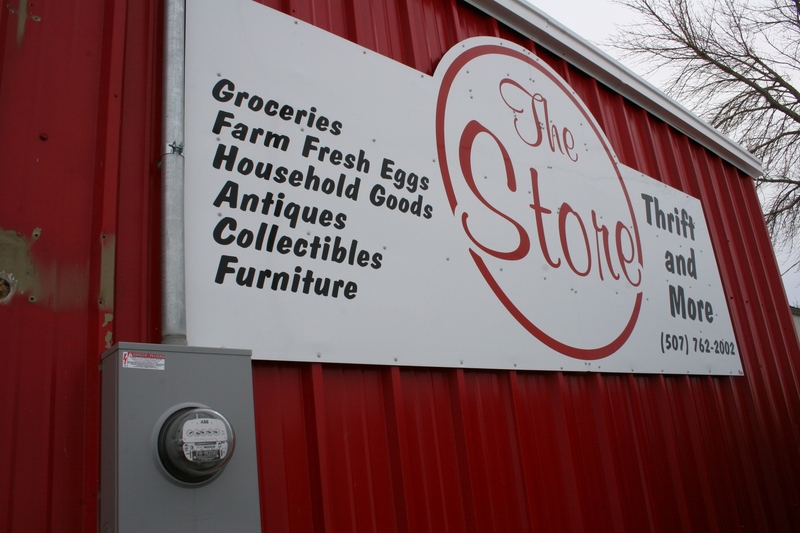 The Store: Thrift and More sits just off Minnesota Highway 19 in Vesta in Redwood County. 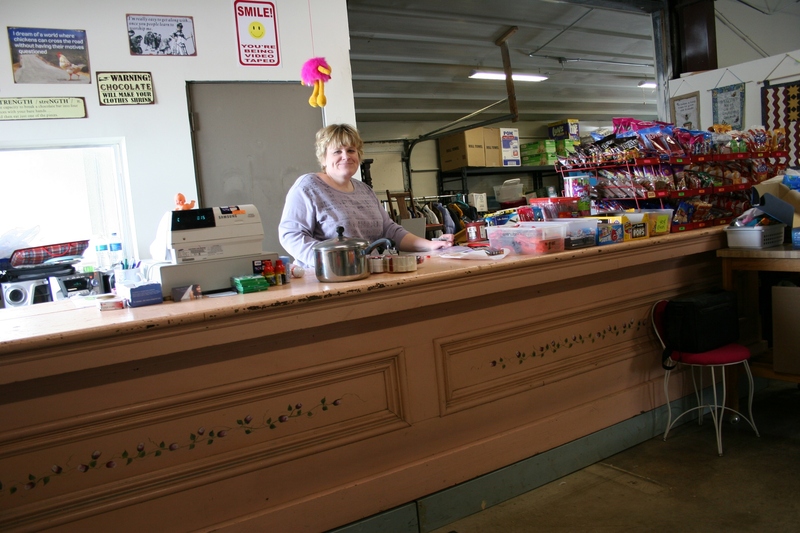 In February she opened The Store: Thrift and More in Vesta, population 330 and the only town along the 40-mile stretch of Minnesota Highway 19 between Redwood Falls and Marshall. 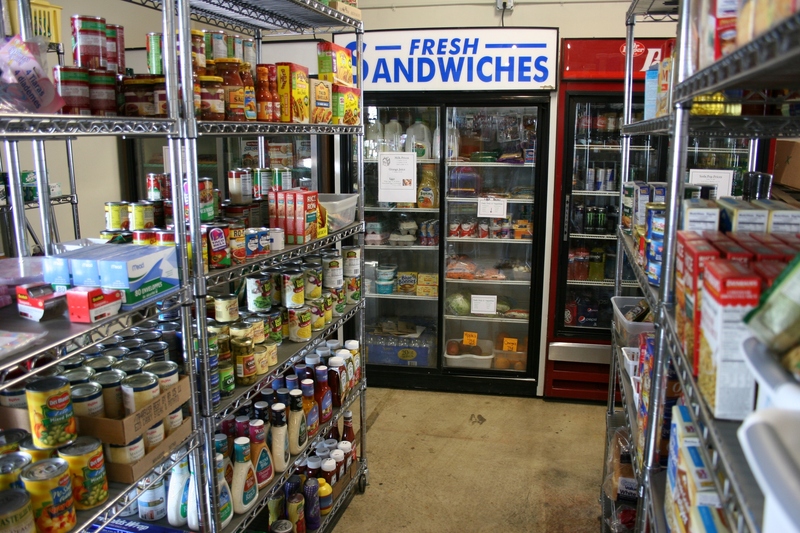 The “more” part of Bernadette’s store includes eight shelving units stocked with foodstuff, personal care items, paper products and more in addition to perishables stashed in nearby coolers. The grocery section of the store includes basic perishables like dairy products, organic eggs, some fruit, lettuce and more. Canned, boxed and bagged foods; personal care items; and miscellaneous items like greeting cards, tape and such fill eight shelving units. I don’t know exactly how long my hometown has been without a grocery store. But it’s been awhile. Locals, like my 80-year-old mom, have had to drive 20 miles either east or west to find the nearest grocery store. Now this community’s residents, many of them elderly, need only walk or drive to the west edge of town to buy a loaf of bread, a gallon of milk, organic eggs from Bernadette and Matt Thooft’s farm, fruit and an assortment of processed foods that include SPAM, much to my mom’s delight. This is huge, to have groceries and basic necessities available in Vesta. Bernadette even offered to have her 11-year-old son deliver right to my mom’s doorstep a block away. Such small-town neighborliness simply warms my heart. Many times the good people of Vesta have assisted my mother. And for that, I am grateful. 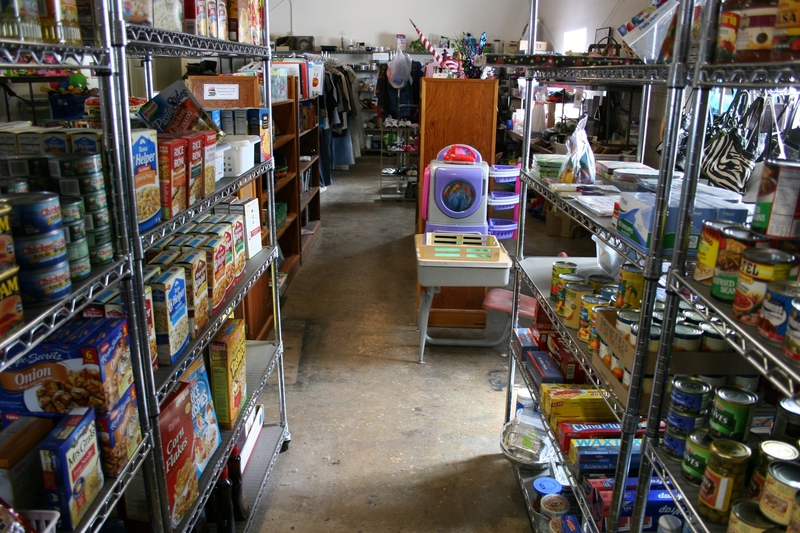 Looking from the front grocery section toward the back thrift area of The Store. Bernadette tells me she originally hadn’t planned on stocking groceries, rather dedicating her floor space to thrift items that range from kitchenware to toys, books to clothing, gift items to home décor and an assortment of other merchandise. 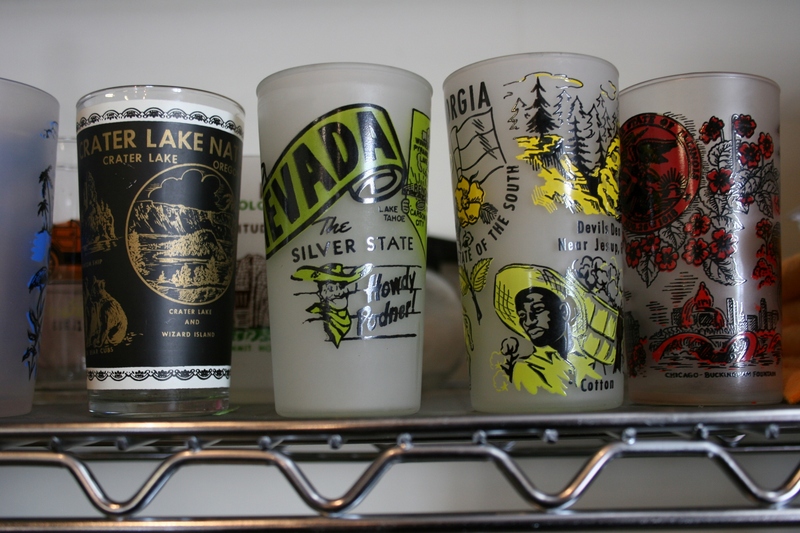 Vintage glasses in the thrift section. 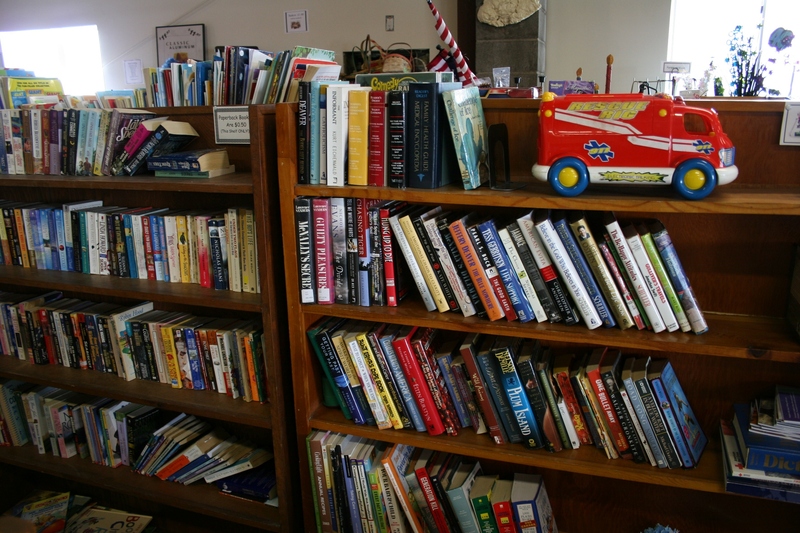 Bernadette offers a great selection of used books for all ages. You’ll also find a shoes and clothing. 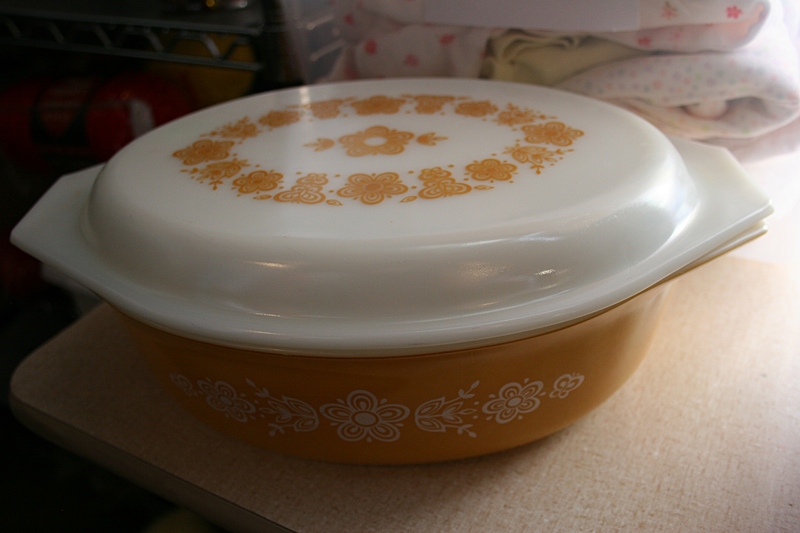 One of my favorite finds in The Store, an $8 vintage Pyrex casserole, which I nearly purchased. But then she started getting requests to carry groceries. So Bernadette decided to buy food and products her family can use. That way, if items don’t sell, she doesn’t lose anything. Once a week this entrepreneur mother drives the 20 miles west to Hy-Vee Foods in Marshall, reselling her purchases in Vesta at a slightly marked up price that will help cover gas expenses. Jason Kramer stops in to buy a few grocery items from Bernadette. It is that type of enthusiasm Bernadette hopes for from other Vesta area residents. She needs their support, and business off the highway, to make her venture work in this isolated prairie town. 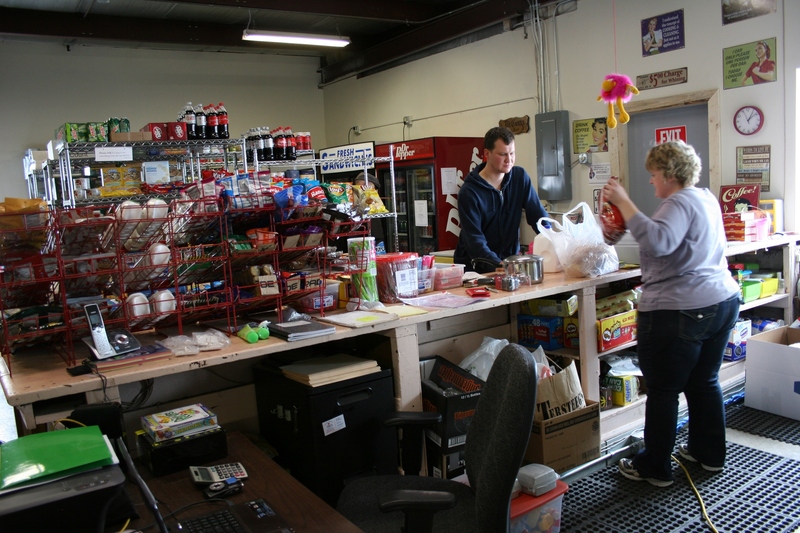 Just another view of the store and Bernadette’s office with Bernadette bagging Jason’s purchases. 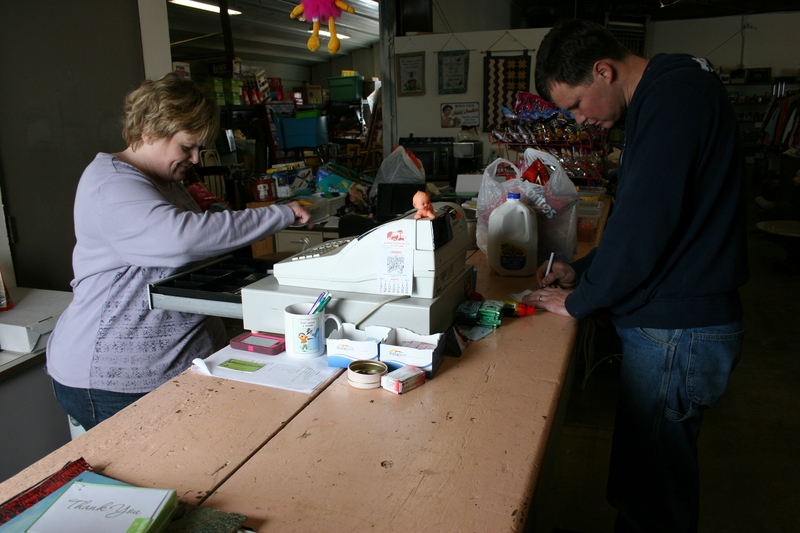 In the short time I perused the store and spoke with Bernadette, several others stopped in—two middle schoolers to eye the toy collection and eventually purchase candy, a middle-aged couple scanning thrift items and then Jason for his groceries. I walked out with a kettle for my college-aged son and my husband grabbed packaging tape and a dispenser. This 1800s general store counter anchors The Store. Those are our purchases on the counter, that kettle and tape. Bernadette says she’s aiming to recreate a Mom and Pop general store with a little bit of everything. I was delighted to find candy lining the 1800s checkout counter, reminding me of the penny candy I bought at Rasmussen’s Grocery while growing up in Vesta. The vintage counter, purchased from a Lake Benton antique store, originated from a general store between Lake Benton and Brookings, South Dakota. It’s the perfect fit for The Store, lending that historic authenticity reminiscent of yesteryear. 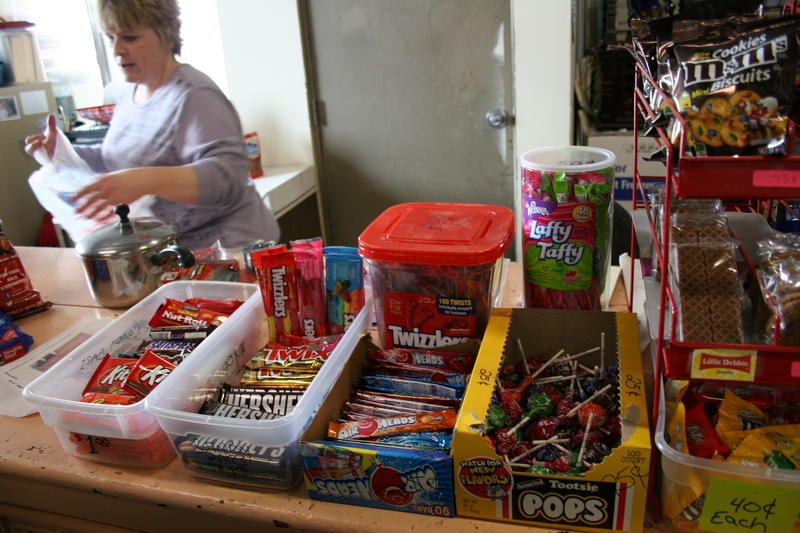 Like the old-fashioned general store, Bernadette has set up a candy display, including my favorite Tootsie Pops. I can remember when Vesta boasted two hardware stores, several restaurants/bars and a grocery store along with other businesses, in its one-block Main Street. Rarely does a new business open here. But Bernadette, who lives on a farm near Lucan seven miles to the south, was looking to locate along the highway, conveniently next door to her husband’s business, Matt’s Frame Repair. 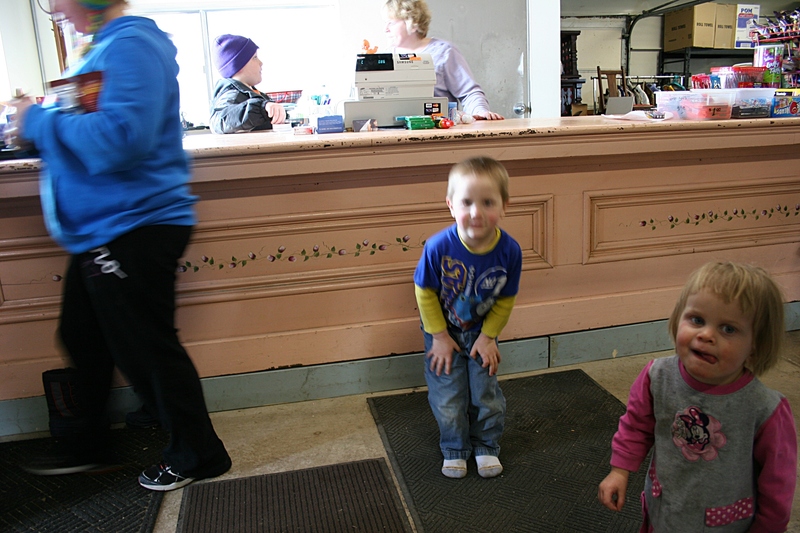 A young customer exits The Store, left, while three of the Thooft kids, including Maxwell, 4, and Beatrice, 21 months, hang out with Mom. The Thooft’s children include an 11-year-old, two 7-year-olds, two 4-year-olds, a 3-year-old and a 21-month-old. She likes that Matt can walk over for lunch and spend time with her and the kids, ranging in age from 21 months to 11 years. She affectionately calls her seven, five of them birth children, two adopted, “the hoodlums.” The kids hang out in a room built into a corner of the poleshed style building. 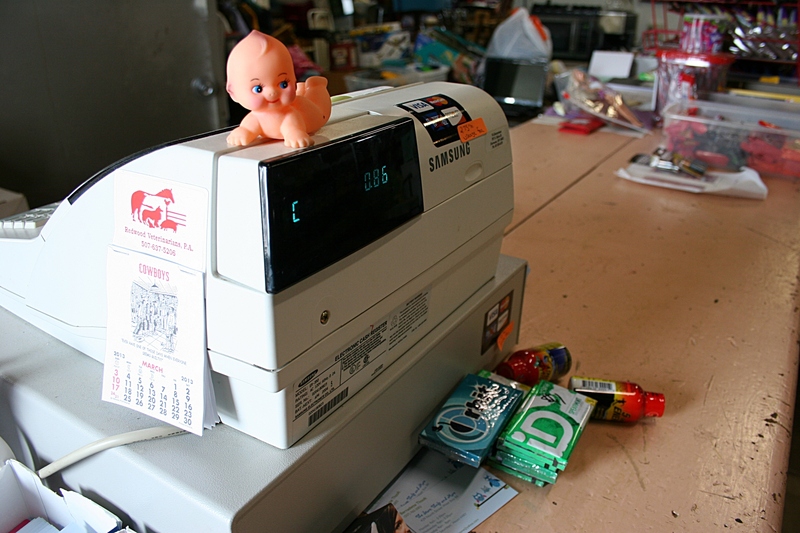 Look around and you’ll see Bernadette’s sense of humor in signage and props like this doll perched upon the cash register. While the kids play and Matt naps in that corner playroom, Bernadette tends to customers on this Saturday afternoon in March. Her laptop sits open on her desk, her reference source for the thrift merchandise purchased primarily from online auctions and also from garage sales. 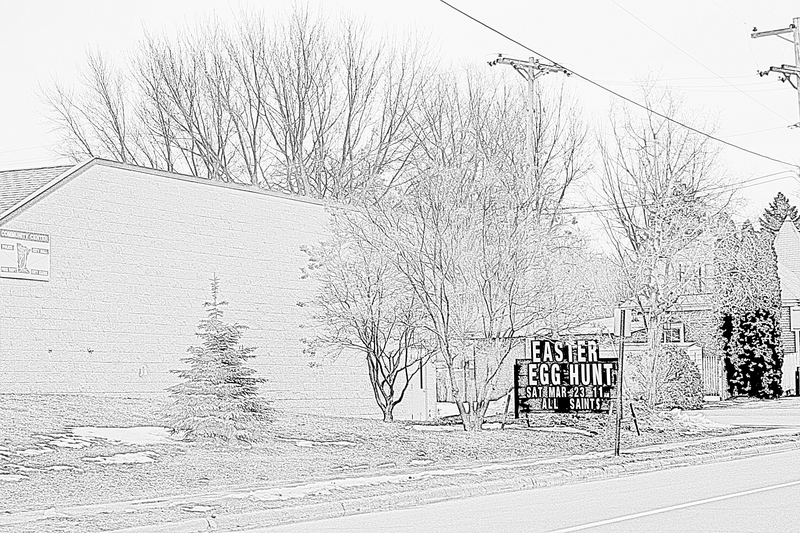 This sign by the thrift store points travelers along Minnesota Highway 19, left, to The Store and the Vesta Cafe. 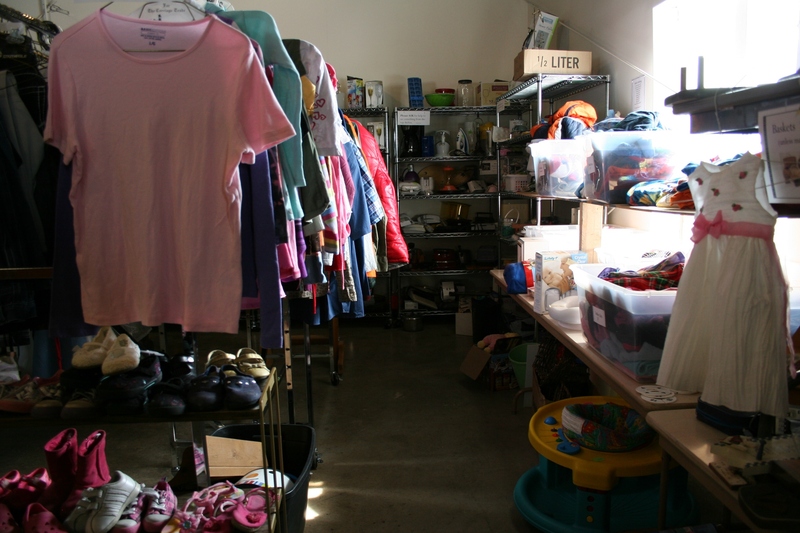 Bernadette is donating 10 percent of thrift sale proceeds to local charities like the United Way, a crisis nursery, area schools and the broader Minnesota Citizens Concerned for Life. She’s also created a “Believe in the Backpack” charity whereby she fills backpacks for kids in foster care. In the short time I’ve spent with Bernadette, it’s clear to me that this Osakis native and former daycare provider loves kids and cares about folks in my hometown enough to open her own little general store on the prairie. And for that I am grateful. This sign graces the front of The Store: Thrift and More. FYI: The Store: Thrift and More is open from 9 a.m. – 5:30 p.m. Monday and Wednesday; from 9 a.m. – 8 p.m. Thursday; and with varied hours on Friday and Saturday. Closed Sunday and Tuesday. I WANTED TO VISIT his grave, touch the cold stone with my gloved hands, allow my eyes to linger on his name, to remember my dad, dead 10 years now on April 3. A trip back to my hometown to visit my mom had thrown me into a temporary melancholy mood as I lounged on her loveseat, head crooked into a pillow, legs angled up as we talked about aging and death and funerals (too many recently). When I mentioned that I’d often thought about the safety layers of generations separating me from death, my husband glanced at me like I was crazy. My 80-year-old mom understood, though. 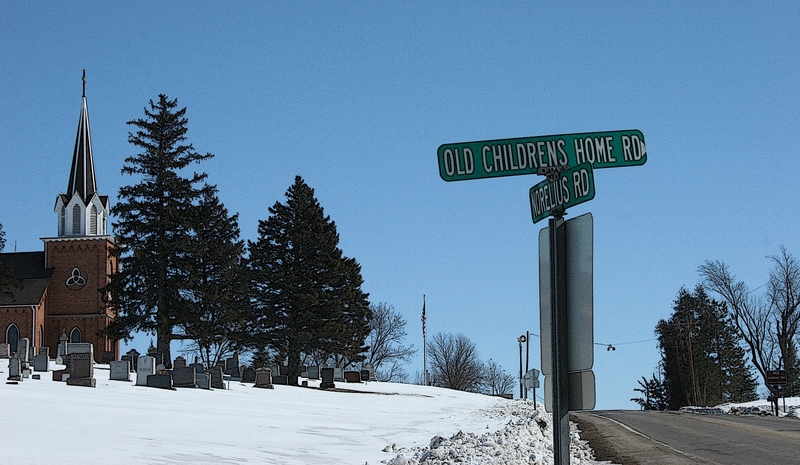 The road past the Vesta Cemetery, left, which sits just outside of this southwestern Minnesota town of some 330. You can see a portion of Vesta’s grain complex to the right. 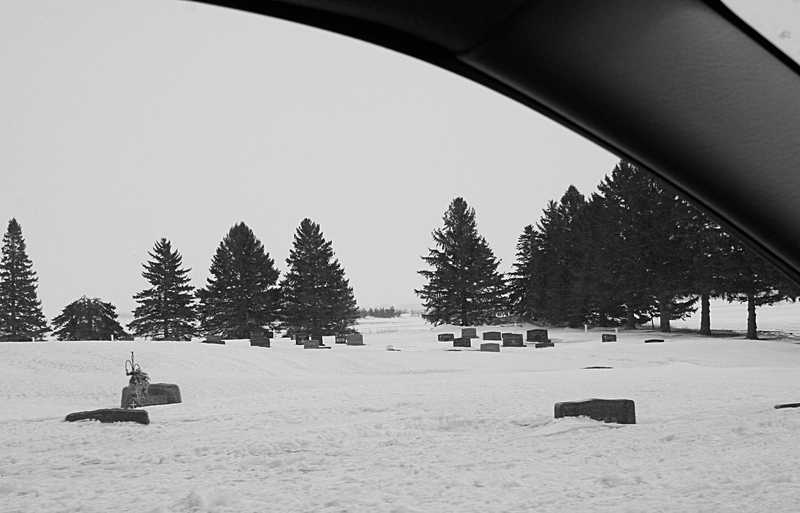 Later, she stayed back at her house while Randy and I drove out to the cemetery, to honor my dad whose gravesite I do not visit often enough because busyness and blizzards have kept me from the prairie in recent months. We headed north out of town along Cemetery Road, tires crunching on gravel, toward the cemetery edged by evergreen trees. At my feet, the short black snowboots I’d borrowed from my mom bumped against my legs. Some of the gravestones are barely peeking out of the snow. I wondered aloud whether the cemetery roads would be plowed of snow swept in by prairie winds. A few blocks later I spotted waves of snow washing over tombstones and roadways. I could not reach my dad’s grave without snowshoes or a snowmobile. The closest I would get to my dad’s grave was viewing the cemetery through the van windows. We eased past the cemetery, drove down to the first farm place to the north, turned around in the driveway and crept past the cemetery again, back into town. I carried my mom’s boots inside, snugged them into a corner of her kitchen, before reclaiming my place on her loveseat. I told her about the tombstones buried in snow. Then we talked about dad’s funeral—the bitter cold of that April day, the cutting wind. 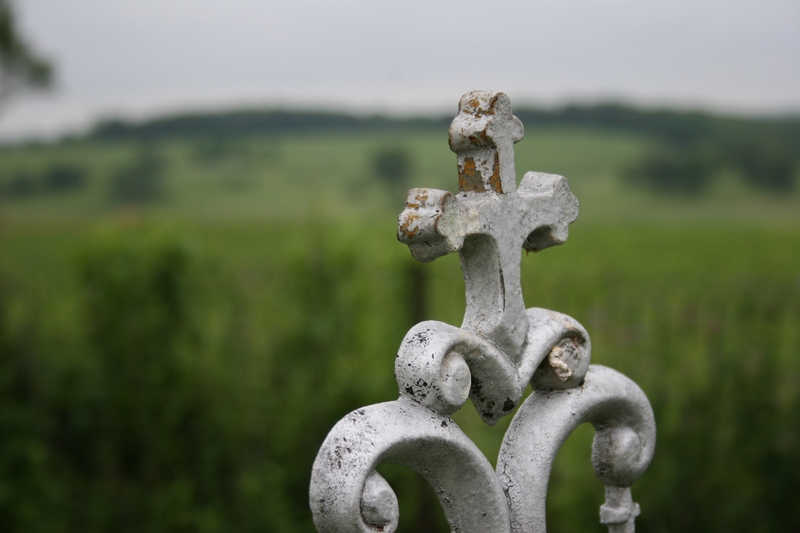 And I remembered, although I did not speak this, how I’d perched on a hard folding chair in that hilltop cemetery 10 years ago, leaned toward my mother shivering in cold and in grief, and wrapped my arm around her.